We declare ourselves against the mentalities and practices that lead to the destruction of the world heritage and we ask the Greek Prime Minister to exercise his authority so that, without any further delays and hypocrisy, the Diolkos is finally saved and restored. The decades-long, ongoing deterioration of the initial parts of Diolkos has been produced among frauds of local & national (probably even international) level. The central government (for example the Ministry of Finance directly supervising the Corinth Canal) has set-up and then covered multiple frauds while the defenseless monument was left to disintegrate. The Ministry of Culture (both under PASOK and ND governments) backed-up every fraud! I hope our new government, based on SYRIZA, and Prime Minister Alexis Tsipras, will finally protect this unique monument, brushing aside the mountains of lies which have been used for decades by unworthy political personnel. So please continue to sign!!! The Diolkos, the unique paved way which enabled transportation of entire fleets overland across the Isthmus of Corinth, is crumbling into the water at its western end. After the excavation (~1960), great part of this famous monument -commonly dated to the times of Periander, ~ 600 BC- was left at the mercy of its position near the Corinth Canal. Although professing care for the monument, the initial parts of which were known to BOTH the Canal Company AND the archaeologists at least since the 1930s, the services of the Greek Ministry of Culture have -for long decades - kept themselves unprepared to protect it, limiting themselves to producing ridiculous lies at every attempt of control. In descriptions given BY THE AUTHORITIES in 2006 and 2007, "subsidence" was presented as almost the only problem of the main course of the monument!!! 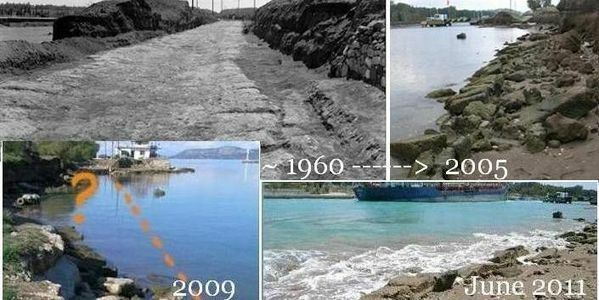 In November 2010, the Greek Ministry of Culture officially "informed" the Prime Minister that Diolkos suffered extensive damage... during the opening of the Canal, in the 19th century!!! A necessary note: This petition was started on 22 november 2006. It, as well as other reports on Diolkos, has repeatedly been brought to the attention of both Mr. Karamanlis' and Mr. George Papandreou's office. Prompted to answer, the Ministry of Culture oficers went on with various inconsistencies and lies. Appallingly, the Ministry had ABANDONED Diolkos' protection to its destroyers (the Canal Company, directly supervised by the Minister of Finance). The "archaeologists" kept backing up the FRAUDS of the Canal which, since passing entirely to the greek state in 1980, had been engaged in a series of MOCK studies for redoing the low walls flanking the narrow part of the Canal. What the Canal Company (comprising by law in its board of Director a high official of the Ministry of Finance and TWO representatives of the local government, plus various "illustrous" appointed Corinthians) was presumably after, was tearing down every vestige of the old low walls of the Canal in order to gain some width and depth while at the same time pretending to conserve the CANAL as a monument. Remodelling the entrances of the Canal was INCLUDED in this intent, promoted by the Ministers of Public Works and Finance (Mr. Tsohatzopoulos and Mr.Tsovolas). Although a great number of documents are kept secret, the Ministry of Culture may have given their blessings to this scheme!!! Roughly half of the excavated Diolkos area lies at the western end of the Canal. Between the illegalitites the Ministry of Culture people MUST have known (but kept silent about) was the fact that the SUPPOSED works the 1984 Canal study proposed would have demolished part of the archaeological remain and probably buried other parts of Diolkos, too. The Canal people covered up the fact that their study was a technical flop with one more mock study (1987) in which a different configuration was proposed for the suffering Diolkos area. Details like this, carefully kept for decades under a law of silence by everybody involved, catapult the Greek Ministry of Culture not only in the center of the Canal frauds but right in their ORIGIN, too. (And we are talking about the period after 1980 - God knows what was going on in the years between the monument's excavation, around 1960, up to 1980! - and there are SEVERAL blind spots later, arriving to the present day: the modern history of Diolkos seems to coprise various "understandings" not only about the excavated monument but also about its possible continuation, as well as other "mysterious" damages to the monument AND even instances of orchestrating "expert opinion" on demand). While the Canal went from one fraud to the next for this PRESUMED goal (between other things, they did not know HOW to technically resolve the issue of tearing down the existing walls, and enlarging the Canal with safety - and they also DEMANDED that the CANAL stay in OPERATION during the works!) even rescue actions were DENIED for the defenseless Diolkos who was being dismembered in an area with plenty of access, much larger width than than proposed for the Canal, and absolutely no problems posed by perilous slopes! At any attempt of outside control about the situation of Diolkos, the Ministry of Culture - although NOT mentioning any arrangements with the Canal - kept complacently and slyly pointing at the direction of the Canal. THIS went on even AFTER a third mock remake of the Canal study, in 1997. (Previous versions had been presented in 1984 and 1987). While backing up the FRAUDS of the Canal (and there is some evidence that they also intervened on the Canal studies), the Ministry of Culture had initiated another FAKE line of "protection" of their own. A "decision" about protection measures in 1988 (probably to cover up the years SINCE the excavation [1956-1960], in which they had never protected the monument) evolved as a study proposing BENCHES for an already dilaniated Diolkos in 1989. This line of action ALSO has to do with the fake attempts of the Canal and it included all sorts of horrific disasters, like the DISAPPPEARANCE of entire stretches of Diolkos itself from official descriptions!!!!! The above give a fairly good idea about why this petition mentions that Diolkos should be saved and restored (*) without further delay and hypocricy. You can read on, for some more details; they cannot cover decades of frauds, scheming (and hidden decisions that MUST have been taken to conceal the various frauds), but they further illustrate WHY Authorities SHOULD take a different stance towards DIOLKOS (and also turn their improductive, deleterious mechanisms upside down). (*) in a scientifically valid and NOT a haphazard way! A 1999 report to Justice Authorities only produced more LIES and hypocrisy on the part of the Ministry of Culture. When, in 2001, the MANAGEMENT of the Canal was leased to a private company [ a presumably BIG deal that soon failed ], the then Head of the local office, Mrs. Spathari, wrote to an enquiring member of the Parliament that protection measures HAD BEEN taken for Diolkos - she even advised him not to worry, because the Diolkos area was well taken care of! This is but an INSTANCE of the continuous lies of Diolkos' keepers (AND the "open line" of the Ministry of Culture with the multiple CANAL FRAUDS). Some PARTIAL temporary interventions (attempted first in 2007 and redone a little better in 2009) are the only REAL work done so far (http://img192.imageshack.us/img192/3867/diolkos2009s.jpg) long after the Ministry had received - on top of everything else! - a POLICE document inviting them to act in order to avoid accidents! Both the local office of the Ministry and the Directorate for the Restoration of Ancient Monuments (DAAM) presented untrue descriptions of the erosion in 2006. For example, DAAM described the longer devastated stretch of Diolkos as having only "subsidence". It followed that there was no hurry in protecting it from the sea! The local office's description TOTALLY DISREGARDED the devastated parts of the monument vaguely PRESENTING as a problem some fallen stones! In 2007, the Ministry pretended to follow an OFFICIAL decision for IMMEDIATE salvage actions, but no other protection work was undertaken! Every attempt of control (as for example reports to Justice Authorities) is met with some meeting or other, sometimes complete with a press release advertising their care for their poor vistim. Sir, The ancient diolkos, a unique monument of the end of the 7th century BC that enabled Greek warships and merchantmen to be moved overland across the Isthmus of Corinth from sea to sea, is progressively crumbling into the water at its western end. We declare ourselves against the mentalities and practices that lead to the destruction of the world's heritage and we ask you to exercise your Authority so that, without any further delays and hypocrisy, the Diolkos is finally saved and restored.